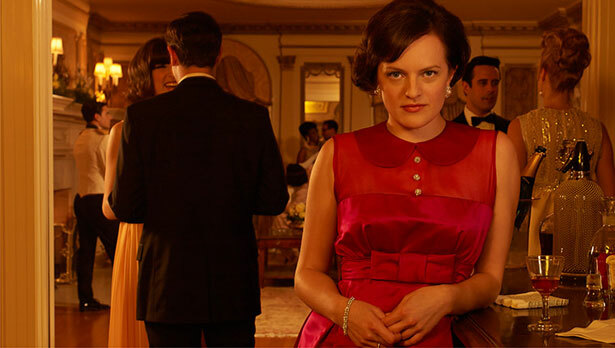 In her new, confident guise, Mad Men's Peggy shows the men how it's done. One of the pleasures of Sunday’s Mad Men premiere was watching Peggy handle herself with aplomb in rooms full of less-qualified, less-intelligent and overall less-competent men. The point the show was making was not subtle, and could in other hands have been accused of being too political, but Elisabeth Moss sold it to us anyway. Which figures: where Mad Men succeeds, it often does so on the strength of the acting rather than the writing. Just imagine if the actress playing Peggy was someone else. In other hands Peggy might be shrill, abrasive or just plain power-drunk. In Moss, you see a Peggy that has learned to modulate her soft tones and hard truths in a way that ultimately lets her win the day. It all feels so timely; women bosses are key figures of the “zeitgeist” right now, for better or for worse. The coupling of Peggy this season with the ubiquity of Sheryl Sandberg’s Lean In would have been media-synergy enough. But add in the death of Margaret Thatcher (who, born somewhere and someone else, might have been a Peggy herself) to the mix and we’re up to our ears in online commentary about the nature of female leadership. And in the avalanche of “woman good” and “woman bad” analyses, how funny is it that the fictional character seems the most realistic? Key to that realism is that Peggy still ran somewhat ashore in her success, at least to her new boss’s mind. After an entire episode in which he’s blithely enjoying himself on vacation during a client meltdown, he compliments Peggy on being “good in a crisis.” But he also tells her she should have sent everyone home once she figured out the solution to a problem late on New Years’ Eve. He even comes in to check on her, expecting chaos, but is pleasantly surprised (and possibly even turned on) by the fact that she’s flourishing. As Alan Sepinwall observes at HitFix, the sequence is clearly there to style Peggy as now being “the female Don Draper.” Who was, it bears remembering, not the greatest boss for Peggy herself, in the end. The scene also bears another potential reading for me, one (forgive the armchair psychoanalysis) developed from what I gleaned as a flicker across Moss’s face. Viewed by a woman who has struggled to assert her authority in a work setting, Ted’s little reprimand is a reminder that what has always worked, and taken as unobjectionable, in Don—a leadership style that was demanding, in time and effort, if not exactly abrasive—would be seen in a wholly other way in Peggy. Namely, as too much. This double standard was the subject of Lean In, which I read when it came out a few weeks ago and, I confess, found it wasn’t “for me.” But it wasn’t because I have lived a life of unbroken radical activism. My irritations with the book emerged precisely because I once worked in a professional office environment, albeit not in tech, that actually much more resembled Mad Men with its terrible office clothing. With that experience behind me, I just want a book that has more to say about the damned-if-you-do, damned-if-you-don’t conundrum of being a woman asserting general authority in the world. To be fair, Lean In did offer a catalogue of small aggressions in the workplace: men listening to each other first, women being relegated to the outer confines of the boardroom table. It is now something of a cliché to observe that these kinds of sexist gestures often feel like relics when seen on Mad Men. Let me add then that it’s equally frustrating to read things that keep missing the point: namely that if women are to get to power they have to shed their anxieties about likability and, not to put too fine a point on it, step on a few (likely male) heads. Sandberg did, of course, encourage women to “speak up.” But she wrote little about why or when that is admirable and her encouragements came out a little measured, at least to me. This is particularly so when she advocates working with men for workplace equality, which I found delightfully disingenuous. It’s not that men are hardwired to be jerks; it’s that, like anyone in power, men will guard their advantages in the workplace. It’s going to take a bit of storming the battalions, like it or not. As a television character, Peggy gets to offer us what Sandberg’s abstract “years of experience” cannot: context. We’ve known her for years now, her emotional development has been catalogued in GIFs and analyzed in countless blog posts. We’ve watched her get thrown under the bus by the men that surround her, and we know (especially as distanced viewers) the blustering games those men play often cover up deep insecurities. This context means that we can see the smaller calibrations she—and here I mean both Moss and Peggy—must make. Peggy accepts Ted’s criticism gracefully and thoughtfully; she deftly turns a client’s “solution” into a reason they should give her more time to resolve the problem. Peggy does it without compromising her smarts, without fluttery self-effacement and without needing to assuage men’s fears that women won’t “work with them.” And that makes her, Grantland’s Molly Lambert once put it, a successful woman in the boys’ club. For all the proof you need, just listen again to the one line where Peggy says, “DEFCON 4 is better than DEFCON 3, I've told you that.” Note the annoyance in her voice. And note that it’s not cutting the man on the other end of the line the smallest bit of slack. In some states, women's rights are hitting new lows. Read Katrina vanden Heuvel's analysis.